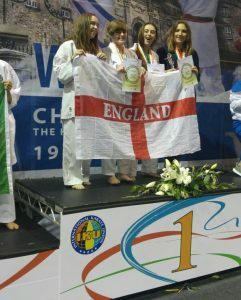 Lauren Newman, Year 12, of Berkhamsted Sixth Form achieved double success at the International Karate Union (IKU) World Championships winning both a gold and bronze medal. Held in Kilkenny, Ireland the Championships is thought to have attracted over 2,500 competitors and spectators. Lauren was selected to represent her country by the English Karate Federation. She helped England to win the Team Kumite (fighting) gold medal and she earned bronze medal for Individual Kumite (fighting). “I was pleased with my performances. Returning to Berkhamsted with two World Championship medals was a nice bonus. I think I did the best I possibly could have done. I didn’t leave anything on the mat” says Lauren. Lauren understands what it takes to compete among the elite having won her first karate national championship at the age of 10. At the World Championships she has won gold in Italy 2013, silver in London 2014 and gold in Slovenia 2015. Having missed out on an individual medal at the World Championships in Dublin last year, Lauren has showed a commitment to training and great strength to reach the podium just 12 months later. A flurry of Berkhamsted School pupils have recently had success on the national and international stage. Tara Sallis won silver at the World Debating Championships, Joe Beadle performed at the BBC Proms National Youth Orchestra, and Alex Bousfield won bronze at the Olympic Hopes in Prague.